Is EOS ICO a SCAM? The highest record earning project, EOS is now facing speculations of being a scam since the leaking of a spreadsheet by Shi Feifei, a Huobi employee. EOS is a third generation smart contract platform, developed by Block.One. Block.One raised $4B over a year-long ICO to create open source software for EOS. The project is led by CEO Brendan Blumer and CTO Dan Larimer. Dan Larimer is a serial entrepreneur that previously founded Bitshares and Steemit. EOS is the most well-funded blockchain in history and seeks to build a next-generation “operating system” for decentralized applications. In this post, we will explore EOS in detail and focus on the three key improvements that EOS attempts to make upon its competitors: scalability, usability, and flexibility. Decentralized ledger technology that is capable of executing smart contracts without a third party intermediary has led to a proliferation of decentralized applications (dApps). 2017 saw an explosion in funding for projects that purported to bring novel use cases to the decentralized industry. As a result, we have begun to build a world where our current internet is replaced with decentralized components, democratizing our financial system and removing intermediaries from many verticals. 2018 marked a much more sobering period. Many projects have failed to launch and those that have, have not garnered any significant usage. While there are many reasons, one significant contributor is that our current infrastructure cannot support the technological requirements for demanding applications. Low transaction throughput, high fees, poor tools for developers, and low scalability are the unfortunate characteristics of existing smart contract platforms. EOS has recognized the need for a next-generation platform that will remedy the many problems inherent to other solutions and ultimately enable decentralized applications to reach their potential. EOS aims to build a blockchain that will eventually scale to millions of transactions per second. They employ a delegated proof-of-stake consensus protocol with 21 designated block producers who are responsible for approving transactions. Block producers are elected through a voting process by token holders. Through this implementation, EOS has optimized for the speed and throughput necessary to enable decentralized applications to function. However, EOS has also sacrificed a level of decentralization in exchange for security and scalability. One of the fundamental differences between EOS and other smart contract platforms, such as Ethereum, is the usage of Delegated Proof of Stake (DPoS) as the consensus mechanism. In DPoS, 21 block producers are responsible for approving all transactions on the network. Anyone can participate in the block production process but they must be elected by the majority of token holders. Token holders can elect block producers in a continuous process where one token equals one vote. EOS does not punish bad behavior through slashing, which is a typical solution with Byzantine Fault Tolerant Proof-of-Stake consensus mechanisms. Instead, EOS gambless that the reputational harm and lost income from censoring transactions will prevent block producers from malicious behavior. The token voting process is ongoing, meaning token holders can theoretically quickly vote out anyone who misbehaves. There are certainly questions as to the security associated with centralizing control around 21 nodes and not implementing any slashing penalties. However, the tradeoff EOS has made by concentrating block production allows for extremely high transaction throughput. EOS is targeting 0.5 sec blocks with 1 sec block confirmation times. The project will scale to between 1000 – 6000 tps, immediately rivaling consumer grade payment processors. For comparison, Ethereum can process ~15 tps, Cardano ~10 tps, and Tezos ~40tps. Early results have shown that EOS can achieve 3500 tps, so the numbers they claim have come to fruition albeit in a short period. EOS expects to eventually scale to millions of transactions per second. Scalability has been the critical theme preventing current smart contract platforms from gaining widespread adoption. Ethereum has seen their blockchain halt multiple times due to the demands of one popular game or a high profile ICO. EOS uses inter-blockchain communication as a horizontal approach to scaling. Optimizing for a single blockchain (vertical scaling) eventually reaches a limit it cannot surpass. Introducing a multi-chain architecture enables higher levels of scalability within individual EOS chains, but also allows connection with any protocol that utilizes a public-private address scheme. Lightweight clients are the foundation of inter-blockchain communication within EOS, where one blockchain can act as a light client to another blockchain. This creates a communication protocol that allows one chain to verify transactions that take place on a different chain. The EOS chain will primarily act as the backbone for individual chains that run side-by-side. The EOS team hopes that the combination of vertical and horizontal scaling will allow it to handle the demands of real-world applications. EOS is taking a pragmatic approach to block production and is conceding high levels of decentralization in return for better performance. What this tradeoff enables is a cheaper blockchain with far better performance. It is challenging to say whether the benefits of higher scalability outweigh the concerns surrounding increased centralization; ultimately, EOS will likely service some applications that prefer scalability to decentralization, while competitors service those that don’t. Over time, we will see if this approach proves beneficial, or if block producers risk forming cartels that operate more like traditional tech behemoths. EOS brings to market a variety of user-friendly smart contract features such as no transaction fees. Instead, EOS compensates block producers solely via inflation. For comparison, Ethereum uses hybrid inflation and fee models to incentivize miners. A small fee and an associated block reward incentivizes miners to include the transaction in the next block. Fees of any kind cause friction for users and are a non-starter for many dApps to compete with centralized alternatives. The fees in Ethereum become expensive as each on-chain transaction carries a cost. Imagine a simple chess game that takes place between two users where each move costs $0.30. If the game takes several hours, that $0.30 can fluctuate drastically based upon network usage. Businesses and users cannot operate in this environment and many of the benefits of the blockchain become overshadowed by the negatives. In EOS, this point of friction is removed entirely; instead block producers are paid entirely via inflation through newly minted tokens. Of the 5% inflation rate, 1% goes towards block producers, and 4% is allocated towards a treasury fund dedicated to future platform developments. These metrics can be changed through the token holder voting process. This fee-less model will provide a completely different experience for users. We can see evidence of this based on an application specific social media platform called Steem. Steem was a prior project of Dan Larimer’s that runs on a blockchain. Steem allows anyone to post content on their social media platform and receive compensation according to the content’s popularity. It is consistently one of the most used blockchains, averaging 1.1 million transactions per day. The EOS architecture will support, not only support Steem-like dApps, but many different dApps of varying complexity. These usability features means that users will likely not even know they are using blockchain technology and will simply see a novel type of application. This is an easily digestible name that anyone with a social media account is familiar with. There is no learning curve for users who tag or pay their friends daily based on their screen name. EOS also offers role-based permission management similar to how traditional organizations assign responsibility. In this setup, it is possible to delegate permission to act on behalf of a user’s account without handing over the private keys. For example, as a contributor to Eden Block, one could get a sub-account @name.edenblock. With the proper permissions, @name.edenblock could post to the @edenblock social media account or interact with applications and not have access to @edenblock’s private keys. While readable addresses certainly contribute to ease-of-use, they also raise concerns over anonymity and privacy. While Bitcoin and Ethereum transactions aren’t exactly private, user addresses provide no information regarding user identities. Name based addresses certainly do. An additional feature allows for recovery of private keys if they are lost or stolen. An account owner can designate a recovery partner to help them activate an owner key that was active in the prior 30 days. With this format, the partner only plays a role in the recovery process and has no power over day-to-day transactions. This combination of no transaction fees, readable usernames, and account recovery optionality makes EOS a very user-friendly blockchain. Today, one mistake with a private key likely means that funds are lost forever. Systems such as that will likely never achieve the usability necessary to get regular people using blockchain technology. Initial users of an EOS based dApp might not even be aware they are using a blockchain because of these features. This positions EOS for success because they will likely be able to avoid the significant amount of education needed to get non-technical users comfortable utilizing the blockchain and cryptocurrency. EOS has the benefit of hindsight. Considering that the EOS team can observe currently implemented solutions, they can design proactive solutions to prevent the same problems currently plaguing platforms. EOS has embraced WebAssembly (WASM), a low-level bytecode for the web that makes it possible to run high-performance code in a browser. Next generation protocols such as Dfinity and Polkadot will launch with WASM, and even Ethereum is working on their own WASM implementation. Compared with Ethereum’s EVM, WASM allows for better speed and, more importantly, supports multiple programming languages (Rust, C/C++, C#, Typescript, etc.). WASM has a robust tooling set that is continually updated. This will open EOS to a broader set of developers who can build dApps in a language they are familiar with instead of unfamiliar languages such as Solidity. Ultimately, developer talent is a scarce resource in the DLT industry. Designing a blockchain that makes it easier for developers will facilitate the onboarding of technical expertise. Smart contracts will inevitably contain errors that affect performance, consuming an unreasonable amount of resources, or placing user funds at jeopardy. EOS solves this by allowing block producers to freeze accounts that act faulty. If 15 out of the 21 block producers agree, an account can be frozen until it’s eventually repaired. This same process also allows code to be updated without the need for hardforks. While this feature has benefits, it opens up the possibility of censorship from block producers under the guise that they are protecting the network. EOS argues that since block producers can be voted out at any time by the users, they are incentivized not to abuse this power. EOS officially launched their mainnet on June 10th. While still incredibly early, the preliminary numbers EOS promised are in line with their demonstrated performance. EOS has at times achieved as high as 3500tps. 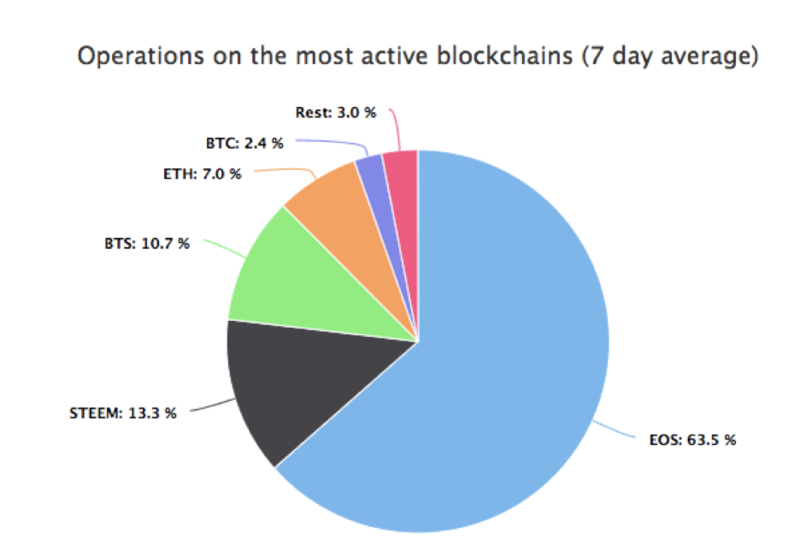 While the network has only been live for ~3 months, EOS accounts for 63.5% of transactions across all the major blockchains (images at end of post). The seven day average of EOS is 5.3M transactions per day. Compare this with Ethereum which accounts for 19% of all transactions and has a 7-day average of 500K. 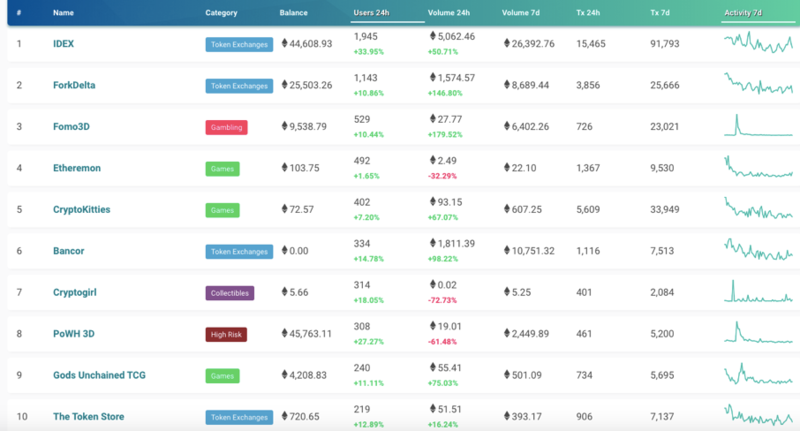 Attached is also a summary of Daily Active Users (DAUs) and popular applications for both EOS and Ethereum. DAUs define how many users take action within a website or decentralized application on a given day. 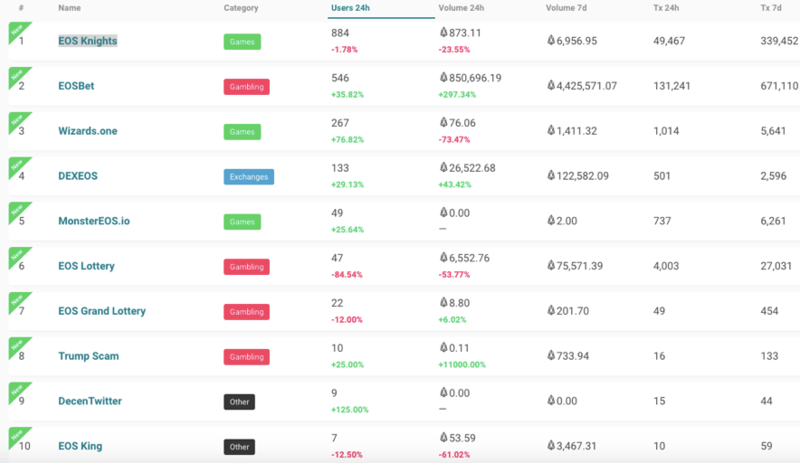 We have found that the top EOS dApps have less DAUs compared to Ethereum, but again EOS is still very new. Given that EOS has garnered solid traction despite its recent launch is impressive. Across both blockchains, the most popular dApps have been exchanges, gambling, and games. While this is to be expected, the real barometer of success will not be determined until more meaningful applications have gained traction. Transactions per second and DAUs, while vital statistics, do not tell the entire story. These numbers provide informative insights but should not be observed in a vacuum. EOS has had arbitrators freeze and censor transactions, bringing up obvious questions regarding the danger of censorship resistance. EOS’ architecture highlights a central question for the DLT industry: how much decentralization is genuinely needed? EOS sits at the center of this debate based on its novel architecture. EOS has some clear performance advantages over its competitors and a robust set of tools to attract developers. 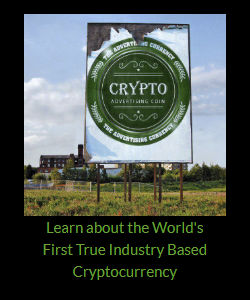 They are also the most well-funded blockchain in history. The competition for smart contract platforms will be fierce in the coming years, and EOS will be a significant player. For a project with EOS’s quality and funding, it was surprising to find that they lack a well-defined roadmap. They have a roadmap on their Github, but it has not been updated since the 1.0 mainnet release. Brendan Blumer, the CEO of Block.One, mentioned that a new roadmap will be released soon. Overall this is one of the most talented teams in blockchain that has had no significant delays in development. EOS was able to meet the first three phases of their roadmap on time, which was necessary to achieve their June 1.0 release. Their past track record should give confidence to the community that they can meet deadlines, but it is perplexing that a clear roadmap is not readily available. The EOS token gives permission for holders to consume a percentage of the network resources on the network (Bandwidth, CPU, or RAM). If a user holds 1% of all EOS tokens they have a right to 1% of the state storage capacity. EOS is the most well-funded blockchain project in history with a total raise over $4B. It is hard to justify raising $4B for any developing company, but given the absence of a hard-cap, the free-market determined that number for EOS. This massive valuation could be a curse, or it could provide EOS with a sufficient treasury for successful development for years to come. Ethereum, Tezos, and Dfinity all have massive funds dedicated to developing their technology and ancillary pieces (developers, community, dApps). EOS brings this same financial backing that will allow it to fund their ecosystem and incentivize developers to use EOS. The EOS token model is unique and provides a clear value proposition to the token. As dApps built on EOS mature, and capacity on the network becomes more scarce, the value of the network and price will rise. Block.One has created an impressive team with a global presence. Block.One has over eighty employees with a focus on technical talent. Dan Larimer is the most notable figure in EOS. He has been involved with blockchain technology since its inception and even has had old bitcointalk conversations with Satoshi Nakomoto, founder of Bitcoin. He previously founded Bitshares and Steem, two projects that have seen success in the cryptocurrency space. EOS has an impressive list of investors. Mike Novogratz and Peter Thiel are both high profile billionaires who have been evangelists in the cryptocurrency space for years. Mike Novogratz, through his investment company Galaxy Digital, is managing a $325M dollar fund for the development of the EOS ecosystem. Bitmain is a behemoth in the mining space and has been strategically broadening their cryptocurrency portfolio. Overall the list of advisors has an impressive background that should be able to aide in the development of the EOS ecosystem. EOS features one of the most well-marketed projects in the industry. From billboard ads in Times Square to lavish parties, EOS has been hard to miss. EOS is highly active on their social media platforms and they all boast a large following. EOS posts new content almost daily in the form of tweets, blog posts, or videos, and is responsive to questions from their community. Time will tell what tangible value this marketing will provide. While marketing is extremely important, the opulence displayed by EOS might turn some people off. EOS was marketed more like a major motion Hollywood film than a smart contract platform. Which projects decide to build on EOS will be the real barometer of its success. Reputational harm from censoring transactions might not be enough to prevent the malicious behavior of block producers. We have already seen action in EOS that suggests the 21 block producers act in lockstep instead of making decisions independently. While EOS is backed by an all-star team and investors, too much money can sometimes be a curse. No team needs $4B before launch, and this money can quickly turn to wastefulness if it is not directed correctly. Their frivolous marketing activities demonstrate the kind of activities that excess money encourages. EOS brings a blockchain to market that looks to tackle the current problems facing smart contract platforms and blockchain technology. Optimizing for transaction throughput, speed, flexibility, and user experience provides it a clear advantage over its competitors. Early usage of the EOS platform has been encouraging, and many projects are already utilizing EOS for compelling products. EOS sits at the center of the debate into how much decentralization is needed to provide censorship resistance. Whether their cryptoeconomic incentives hold overtime and if block producers can truly be independent will be critical questions to answer. EOS represents one of the most exciting, and controversial, projects to launch since Ethereum. If a successful ecosystem develops as they predict, EOS is a genuine threat to capture a significant market share from Ethereum and other smart contract platforms. Did you like our analysis of EOS?